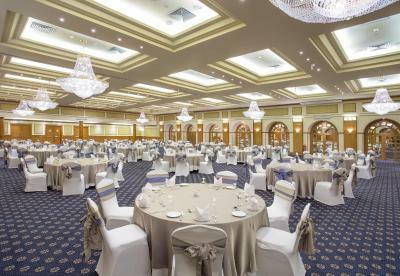 Lock in a great price for Steigenberger Nile Palace - Convention Center – rated 8.7 by recent guests! Excellent location on the banks of the Nile. Friendly and accommodating staff - in particular the reception, concierge and restaurant staff. Large and comfortable rooms. Large breakfast buffet and many restaurants on site. Amazing service! Clean rooms and good food easily available at one of the many restaurants. This hotel, it’s staff, the restaurants, and the dance show were simply amazing. We loved it and if we are ever in Luxor again, will stay here. Thanks to the hotel and staff for a great stay! The restaurant for breakfast was great and perfectly located. The service was excellent as were the choices, restaurant staff, cleanliness and food. Great Stuff Great location Wonderful food Very clean Every thing was fabulous! !! The amazing staff and the cleanliness of the hotel. Nice property with an excellent view to the Nile river. Very accessible from the main road and at short distance from the sightseeing places and market. Good restaurants inside and at walking distance from the hotel. They were quick to respond to a doctor request when my daughter suddenly developed high fever. They went over and above with our late checkout request, due to my daughter's ill-health on the previous day. 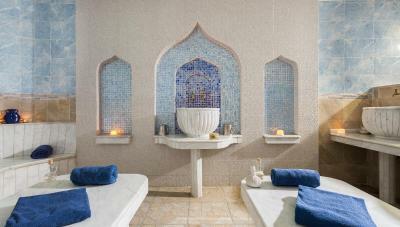 The staff was very friendly, especially mustafa at the front desk and amina (guest relationships). The rooms were comfortable. The staff is really very hospitable.. smiling and helpful trying to please you in any way .. i specially liked the lady at the breakfast reception desk beautiful smile, and the whole staff .. really thank you for being so nice to the guests. 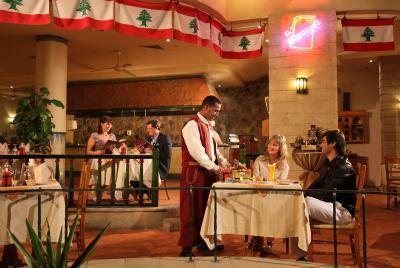 The Delices cafe is also very nice for snacks, and the view on the nile by the pool is gorgeous and relaxing. The rooms size is good, clean bathrooms, and some nice shops. 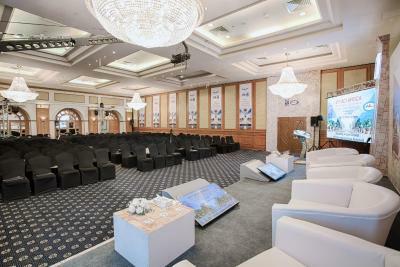 Steigenberger Nile Palace - Convention Center This rating is a reflection of how the property compares to the industry standard when it comes to price, facilities and services available. It's based on a self-evaluation by the property. Use this rating to help choose your stay! One of our top picks in Luxor.This Steigenberger hotel is located in the heart of Luxor and provides modern accommodations with stunning views of the Nile. The spacious rooms are air conditioned and feature satellite TV. Some have a balcony and all are filled with natural light. Nile Palace Luxor Hotel is conveniently located within a short walk of Luxor's large shopping district. Luxor Temple is 0.6 mi away. 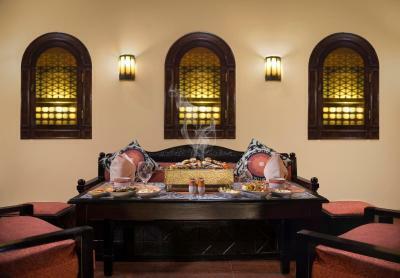 Nile Palace Luxor offers a wide choice of restaurants, serving Lebanese and international cuisine. Guests can access the Karnak VIP lounge which offers light snacks, fresh juices, coffee/tea and a daily newspaper. Guests can make use of the fitness center and sauna. The hotel also offers a 24-hour front desk and staff can help organize local tours. When would you like to stay at Steigenberger Nile Palace - Convention Center? Featuring a balcony or window, this air-conditioned room offers views of the city, a safety deposit box and a mini-bar. It also includes a seating area and a satellite TV. The bathroom is fitted with a hairdryer. WiFi is available at an added fee. This air-conditioned room includes a double or twin beds, a minibar and satellite TV. 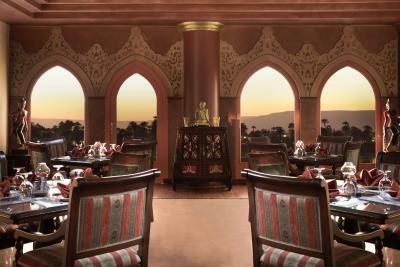 Most rooms have a balcony or terrace overlooking the Nile or Luxor's main boulevard. Non-smoking rooms are available. 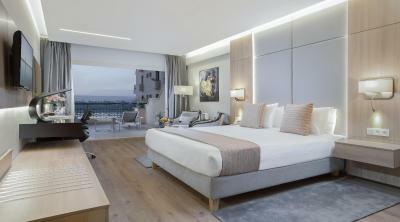 Decorated in sand tone, this air-conditioned suite features a balcony with City View . It also includes 2 bathrooms and separate lounge and seating area. It comes with a complimentary basket of seasonal fruits once on arrival day. 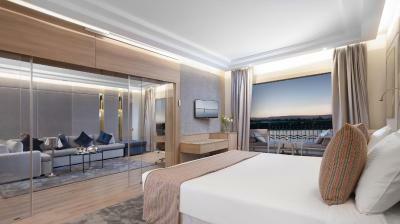 Featuring panoramic views of the Nile, this spacious suite offers separate areas for work, sleep and relaxation. It has one king-sized bed room and one room with 2 separate beds. The elegant Presidential Suites blend luxury with practicality in an airy and artfully executed layout. The family room has a sharing terrace spacious enough for the whole family to enjoy their time family room has two units one with two separate beds & the other one has 1 king size bed or two separate beds. This newly renovated twin/double room has with patio view, It includes Complimentary Karnak Lounge Access, Complimentary WIFI , Flat-screen TV, a mini-bar, electric kettle , and a bathroom with a hairdryer. This newly renovated twin/double room has with partial view on the Nile. It includes Complimentary Karnak Lounge Access, Complimentary WIFI , Flat-screen TV, a mini-bar, electric kettle , and a bathroom with a hairdryer. This newly renovated twin/double room overlooking the Nile includes Complimentary Karnak Lounge Access, Complimentary WIFI , Flat-screen TV, a mini-bar, electric kettle , and a bathroom with a hairdryer. 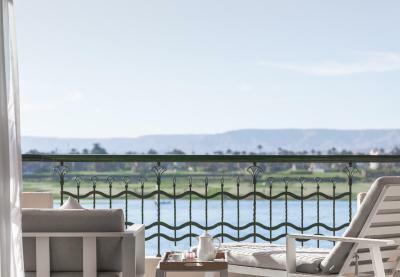 This suite offers breathtaking views of the River Nile includes seating area, Complimentary Karnak Lounge Access, Complimentary WIFI , Flat-screen TV, a mini-bar, electric kettle and a bathroom with a hairdryer. This Executive Triple room overlooking the Nile includes Complimentary Karnak Lounge Access, Complimentary WIFI , Flat-screen TV, a mini-bar, electric kettle , and a bathroom with a hairdryer. The Steigenberger Nile Palace lies on the banks of the Nile, not far from the Temple of Luxor. Here, amid ancient sites and archaeologically significant finds, you can enjoy the special atmosphere and comfort of a top quality modern hotel. You can use the hotel as a base to explore the cultural diversity of the region, enjoy a great many leisure activities or take a gentle stroll along the main boulevard. House Rules Steigenberger Nile Palace - Convention Center takes special requests – add in the next step! Steigenberger Nile Palace - Convention Center accepts these cards and reserves the right to temporarily hold an amount prior to arrival. For New Year's Party & Gala Dinner on 31st December 2019, please be advised that the rates are inclusive for this event when booking this night directly online. Rooms a bit dated, as well as gym equipment. Opening hours for spa and gym not very convenient, especially after a long day visiting the sites. Decore of the room I felt was rather worn, needed updating; in fact still had a safety sign from the previous owner in the room. Also, non smoking rooms should only have people who don't smoke in the rooms. The room smelt of stale smoke. The staff were excellent, all were very attentive. Everything was great. Good restaurants. Beer is a bit pricey. Wi fi should be better and free . The room was clean. Comfy bed! We didn’t like that we couldn’t stay longer! Good location.enjoyed evening entertainment. Only downside is lack of free Wi-fi. Our favourite spot in Egypt. Gorgeous hotel with great facilities and views. The rooms were spacious with lots of storage, and very modern and clean. Breakfast was incredible and staff incredibly friendly. The views were amazing and the location perfect, walking distance to several places to eat. Just down the road from all the sights on the East Bank. Couldn’t be any better! Room service was quite slow - requested for a towel ( only 2 towels for 3 of us) & it took more than an hour to get it. There was loud soccer game being watched on TV after 9.30pm & some had to catch early flight or hot air balloon ride and it was quite disruptive. The complimentary fruits added a nice touch. Breakfast spread was very good!! The customer service manager took care of a problem in our room in no time. The boxed breakfast for early morning flights were well thought of & packed with finesse- another nice touch. The property location was great, with views over the Nile and a short walk to many restaurants. The staff were very kind and attentive. Buffet breakfast was amazing. Cannot fault a thing.